5th Sunday of Great Lent. Matins and Divine Liturgy. BRETHREN, when Christ appeared as a high priest of the good things that have come, then through the greater and more perfect tent (not made with hands, that is, not of this creation) he entered once for all into the Holy Place, taking not the blood of goats and calves but his own blood, thus securing an eternal redemption. For if the sprinkling of defiled persons with the blood of goats and bulls and with the ashes of a heifer sanctifies for the purification of the flesh, how much more shall the blood of Christ, who through the eternal Spirit offered himself without blemish to God, purify your conscience from dead works to serve the living God. On the Fifth Sunday of Lent the Orthodox Church commemorates our Righteous Mother Mary of Egypt. The feast day of Saint Mary of Egypt is April 1, however, she is also commemorated on this Sunday due to her recognition by the Church as a model of repentance. One day, seeing a crowd of Lybians and Egyptians moving towards the port, she followed them and set sail with them for Jerusalem, offering her body to pay her fare. When they arrived in the Holy City, she followed the crowd that was thronging towards the Church of the Resurrection, it being the day of the Exaltation of the Cross. But, when she reached the threshold of the church, an invisible force prevented her entering in spite of repeated efforts on her part, although the other pilgrims were able to go in without hindrance. Left alone in a corner of the narthex, she began to realize that it was the impurity of her life that was preventing her approaching the holy Wood. She burst into tears and smote her breast and, seeing an icon of the Mother of God, made this prayer to her: "O Sovereign Lady, who didst bear God in the flesh, I know that I should not dare to look upon thine icon, thou who are pure in soul and body, because, debauched as I am, I must fill thee with disgust. But, as the God born of thee became man in order to call sinners to repentance, come to my aid! Allow me to go into the church and prostrate before His Cross. And, as soon as I have seen the Cross, I promise that I will renounce the world and all pleasures, and follow the path of salvation that thou willest to show me." She felt herself suddenly freed from the power that had held her and was able to enter the church. There she fervently venerated the Holy Cross and then, returning to the icon of the Mother of God, declared herself ready to follow the path that the Virgin would show her. A voice replied to her from on high: "If you cross the Jordan, you will find rest." During the first seventeen years, her clothes soon having fallen into rags, burning with heat by day and shivering with cold by night, she fed on herbs and wild roots. But more than the physical trials, she had to face violent assaults from the passions and the memory of her sins and, throwing herself on the ground, she implored the Mother of God to come to her aid. Protected by God, who desires nothing but that the sinner should turn to Him and live, she uprooted all the passions from her heart by means of this extraordinary ascesis, and was able to turn the fire of carnal desire into a flame of divine love that made it possible for her to endure the implacable desert with joy, as though she were not in the flesh. After all these years, a holy elder called Zosimas (April 4), who, following the tradition instituted by Saint Euthymios, had gone into the desert across the Jordan for the period of the Great Fast, saw one day a human form with a body blackened by the sun and with hair white as bleached linen to its shoulders. He ran after this apparition that fled before him, begging it to give him its blessing and some saving words. When he came within ear-shot, Mary, calling by name him whom she had never seen, revealed to him that she was a woman and asked him to throw her his cloak that she might cover her nakedness. At the urging of the monk, who was transported at having at last met a God-bearing being who had attained the perfection of monastic life, the Saint recounted to him with tears the story of her life and conversion. Then, having finished her account, she begged him to come the following year to the bank of the Jordan with Holy Communion. When the day arrived, Zosimas saw Mary appearing on the further bank of the river. She made the sign of the Cross and crossed the Jordan, walking on the water. Having received Holy Communion weeping, she said: "Lord, now lettest Thou Thy servant depart in peace according to Thy word; for mine eyes have seen Thy salvation" (Luke 2:29). She then took leave of Zosimas, asking him to meet her the following year in the place where they had first met. When the year was past, Zosimas, going to the agreed spot, found the Saint's body stretched on the ground, her arms crossed and her face turned towards the East. His tearful emotion prevented him from noticing at once an inscription traced on the ground by the Saint, which read: "Abba Zosimas, bury here the body of the humble Mary; give what is of dust to dust, after having prayed for me. I died on the first day of April, the very night of the Passion of our Lord and Savior Jesus Christ, after having partaken in the Holy Eucharist." Consoled in his grief by having learned the Saint's name, Zosimas was amazed to discover that she had, in several hours, covered a distance of more than twenty days' march. After having vainly tried to break up the earth with a stick, he suddenly saw a lion approaching Mary's body and licking her feet. On the orders of the Elder, the beast dug a hole with its claws, in which Zosimas devoutly placed the Saint's body. On his return to the monastery, he recounted the marvels that God had wrought for those who turn away from sin and move towards Him with all their hearts. From the hardened sinner that she had been, Mary has, for a great many souls crushed under the burden of sin, become a source of hope and a model of conversion. This is why the Holy Fathers have placed the celebration of her memory at the end of the Great Fast as an encouragement for all who have neglected their salvation, proclaiming that repentance can bring them back to God even at the eleventh hour. 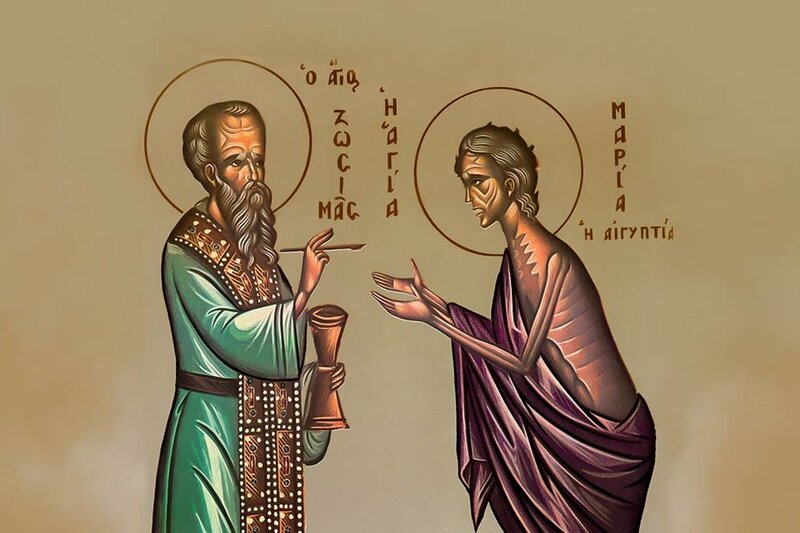 The feast day of Saint Mary of Egypt is April 1, the day of her repose, however the Orthodox Church also commemorates the Saint on the Fifth Sunday of Lent. As a Sunday of Great Lent, the commemoration is celebrated with the Divine Liturgy of Saint Basil the Great, which is preceded by a Matins (Orthros) service. A Great Vespers is conducted on Saturday evening. Scripture readings for the Fifth Sunday of Lent are the following: At the Orthros (Matins): The prescribed weekly Gospel reading. At the Divine Liturgy: Hebrews 9:11-14; Mark 10:32-45. Saint Mary of Egypt is also commemorated on the Thursday before the Fifth Sunday of Lent, when her life is read during the Great Canon of Saint Andrew of Crete. A canon in her honor is read at the end of each Ode. In parish churches the service and the canon is most often conducted on Wednesday evening. In you the image was preserved with exactness, O Mother; for taking up your cross, you did follow Christ, and by your deeds you did teach us to overlook the flesh, for it passes away, but to attend to the soul since it is immortal. Wherefore, O righteous Mary, your spirit rejoices with the Angels. Having escaped the gloom of sin, O blest Mary, and shining brightly with the light of repentance, thou didst present thy heart to Christ, O glorious one, bringing HimHis Holy and all-immaculate Mother as a greatly merciful and most bold intercessor. Hence, thou hast found the pardon of thy sins and with the Angels rejoicest for evermore. Adapted from The Synaxarion: The Lives of the Saints of the Orthodox Church, Vol. 4, compiled by Hieromonk Makarios of Simonos Petra and translated from the French by Mother Maria Rule and Mother Joanna Burton (Chalkidike, Greece: Holy Convent of the Annunciation of Our Lady, 2003) pp. 295-298. Talbot, M. Holy Women of Byzantium, Ten Saints' Lives in English Translation. (Genealogical Publishing, 1996), pp. 65-94. 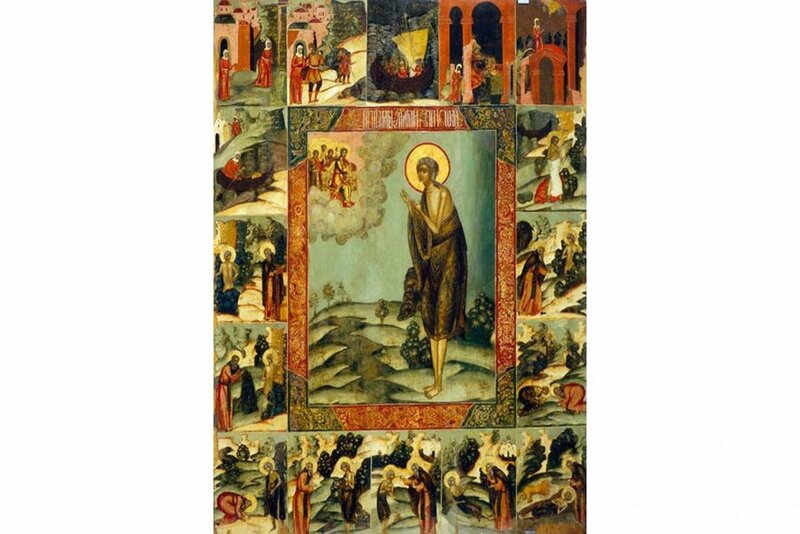 The Lenten Triodion. Translated by Mother Mary and Kallistos Ware (South Canaan, PA: St. Tikhon's Seminary Press, 1994), pp. 56, 370-416, 447-462. Schmemann, Alexander. Great Lent: Journey to Pascha (Crestwood, New York: St. Vladimir's Seminary Press, 1969). Barrois, Georges. Scripture Readings in Orthodox Worship (Crestwood, New York: St. Vladimir's Seminary Press, 1977), pp. 68-69. Farley, Donna. Seasons of Grace: Reflections on the Orthodox Church Year (Ben Lomond, CA: Conciliar Press, 2002), pp. 113-116. The Service of The Akathist Hymn.